Democrats outnumber Republicans, so overall 46% of the country favors the bill vs. 40% who don’t. Still, independents remain skeptical: 46% are unfavorable vs. 36% who are favorable. That’s going to take some work to overcome. On that score, there’s some good news and some bad news. The good news is that Kaiser also polled some of the specific provisions of the healthcare bill that take effect quickly, and virtually all of them were extremely popular. Every single one polled over 50% and virtually all of them were favored by more than two-thirds of the respondents. Even Republicans approved of most of them. So that’s something to work with. And the bad news? People are pretty savvy about who the bill will help: the poor, the uninsured, and those with preexisting conditions. However, only 31% think it will help them, and broadly speaking, they’re probably right about that in the short term. For most voters, then, we’re going to have to appeal to the better angels of their nature, and that’s always a crap shoot. 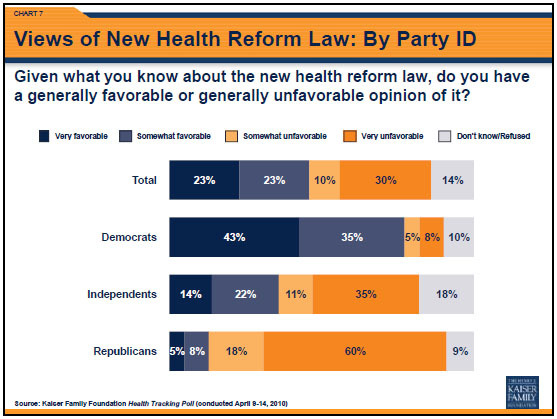 This all comes via Austin Frakt, who points to another part of the poll that says 26% of the country got at least some of their information about healthcare reform via blogs and non-media websites. Not bad! Only 6% said it was their most important source, but that doesn’t strike me as surprising. After all, even for me I’d have to say that it’s a close call whether blogs or traditional news media were my most important source of information about healthcare reform. Being a healthy part of the mix is probably about as much as we can hope for.